From Australias favourite new health-food chef comes the follow up to the bestselling Fabulous Food Minus the Boombah. Like most of us, Jane Kennedy cant eat anything she wants because she gets FAT. After having five children in six years and trying every fad diet known to man in an attempt to shift excess weight, Jane decided to take matters into her own hands. A lifetime love of cooking, teamed with a refusal to give up the flavours of her favourite meals, led Jane to develop her own dishes that are delicious but also good for you. In Janes second book, OMG! I can eat that?, she shares some of her favourite recipes, just without all the unwanted fat. Chapters include Nibbles, Soups, Piemakins, Chicken & Duck, Beef, Lamb & Pork, Fish & Seafood, Comfort Classics, Vegetables and Dessert. And these recipes arent your typical diet recipes either, with delicious meals such as Chicken, Leek and Mushrooms piemakins (pies in ramekins minus the pastry), Beef Bourguignon, Boombahfree burgers, and even sweet treats like Rhubarb and strawberry crumble, youll forget youre even eating food minus the boombah! 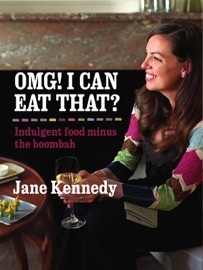 wtf this great omg-i-can-eat-that.pdf Kindles eBook for free!